This book traces the prehistory and initial development of wavelet theory, a discipline that has had a profound impact on mathematics, physics, and engineering. Interchanges between these fields during the last fifteen years have led to a number of advances in applications such as image compression, turbulence, machine vision, radar, and earthquake prediction. This book contains the seminal papers that presented the ideas from which wavelet theory evolved, as well as those major papers that developed the theory into its current form. These papers originated in a variety of journals from different disciplines, making it difficult for the researcher to obtain a complete view of wavelet theory and its origins. Additionally, some of the most significant papers have heretofore been available only in French or German. 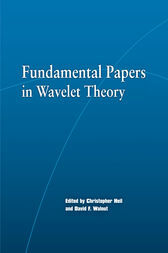 Heil and Walnut bring together these documents in a book that allows researchers a complete view of wavelet theory's origins and development. Chris Heil is Professor of Mathematics at the Georgia Institute of Technology. His research interests are in harmonic analysis, especially time-frequency and time-scale methods and their applications. David Walnut is Professor of Mathematics at George Mason University. His research interests are also in harmonic analysis, especially sampling theory, Radon transforms, and tomography. He is the author of Introduction to Wavelet Analysis. Ingrid Daubechies is the author of Ten Lectures on Wavelets, which won the American Mathematical Society's 1994 Leroy P. Steele Prize for exposition.